Jeevan GC grew up in rural Nepal where basic infrastructure, including electricity and transportation, was lacking. Agriculture was his family’s primary source of income. With no modern distractions, Jeevan developed a deep attachment to nature, often wondering how it all worked. His father, wanting to foster Jeevan’s curiosity, enrolled him in an English school not far from their village. As he progressed in his studies, he came to appreciate that physics holds the key to understanding nature. He enrolled in the biophysics program at a university in Nepal. One day, he attended a seminar by a guest speaker — Prem Chapagain, an associate professor of physics at FIU. Jeevan decided then that he wanted to pursue a Ph.D. at FIU and study how proteins, DNA and other biomolecules function. 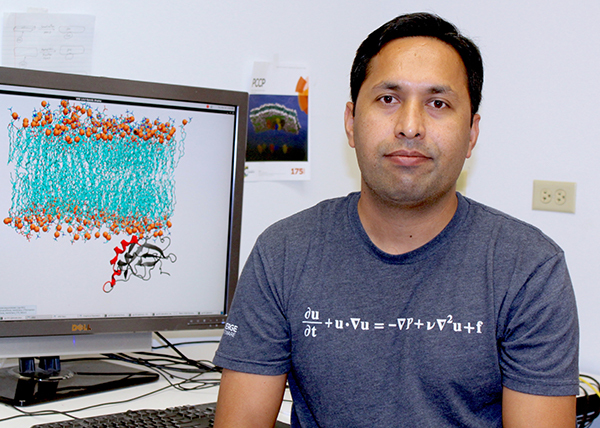 At FIU, Jeevan worked with a class of proteins called transformer proteins. Meanwhile, a world away, West Africa was battling the worst Ebola outbreak in history. Jeevan’s ever-growing curiosity got him thinking — what if the Ebola virus depends on a transformer protein to function? And if it does, could he find a weak spot to target and destroy the virus? Working with Chapagain and physics chairman Bernard Gerstman, Jeevan found answers to both questions. Yes it does and yes he could. Today, his research could lead to improved disinfectants for the Ebola virus. Jeevan has accepted a research position at Washington State University where he will focus on designing new drugs to fight cancer.